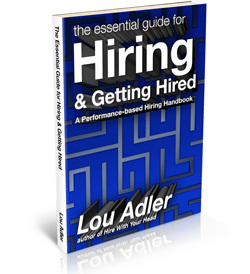 Hiring Managers and recruiters will be howling once their candidates get a hold of Lou Adler’s newest book, The Essential Guide for Hiring & Getting Hired. Order Lou's New Book Now! 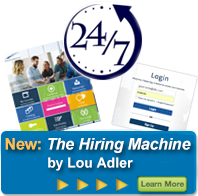 Why you must convert jobs into careers to increase new-hire job satisfaction and OTJ performance. How to ask and answer every important interview question and the dumb ones, too. Why you should never apply through HR, and the only reason why you should. How candidates can make sure interviewers ask the right questions. Why 30-minute serial interviews will prevent you from ever hiring the right person. Why you want to be underpaid. Collecting the necessary information to properly use the candidate hiring-decision matrix. This will be the best “less than $10 investment” you’ll ever make, whether you’re hiring or being hired.